The beauty in Android lies in its customization capabilities. For this reason, you’ll often find that no two Android phones are the same, even if they are the exact same models. From launchers to themes, you’ll find that there’s so many ways of making your phone special to you that you might start feeling overwhelmed. Fear not! We have taken the time to compile a list of the best 5 launchers of 2016 (so far) so that you’ll at least get a better idea of where to start. Almost unanimously crowned as the best of the best, Nova Launcher is always a family favourite. With the free version, you get the ability to change icon themes, change the way your grid looks, change the animation, and how your home screen (and dock!) scrolls. Users often say that their number one favourite thing about Nova Launcher is that it makes their phone look and feel faster. Because Nova Launcher doesn’t allow you to use certain Samsung Touchwiz exclusive widgets like S Planner and the developers are constantly updating the launcher, there’s very few hiccups and glitches when you use Nova Launcher. This launcher is also available in a paid version, called Nova Launcher Prime. Right now it’s ON SALE for just $0.99! With Prime, you get extra features such as gestures, unread count badges (and removal of notification badges), ability to hide apps, and custom drawer groups. Since the popularity of launchers, Google was not about to be left behind. Their popular Google Now Launcher brings you back to the basics with Google Now integration. Because they strive to bring minimalist styles to your phone, your phone feels quick and smooth, just like with Nova. Get access to your customized Google Now cards with a simple swipe right. Voice-only controls are also more accessible with “Ok Google,” and you get the much coveted vanilla-Android style A-Z apps list. GO Launcher has been around for a long time and it has one of the longest standing fanbases of all time. The greatest thing about GO Launcher isn’t that it allows you to customize things like animation effects, icons, and a DIY Themer. The greatest thing about GO Launcher is how much support it has. There’s more than thousands of different themes and plug-ins that you can install, providing you with a variety of different customizable options depending on what theme you use. For example, you can get specific themes, such as Disney movies, with the matching icon packs. You can get almost anything you can think of as a theme. You can also access themes with actions designed specifically for certain apps, such as changing your keyboard or your messaging app. The one caveat for this launcher is that because there are so many different possibilities available, it can take some time to find the perfect combination for you. The Apex Launcher is similar to Nova in terms of functions. You can change the transition effects, change the scrolling, folder previews, drawer styles, and hide apps from your app drawer. You also unlock features such as functions, which allows you to pinch ors swipe or double tap for Like GO Launcher, there’s different themes available for you to download and use. Gestures are available as well, so you can launch different apps through a series of pinches, swipes, or double taps. This launcher is also available in a paid version with additional features, including unread count notifications, drawer customizations, and more gesture options. There’s also the ability to merge folders together and have overlapping widgets, too. Action Launcher is a theme inspired by Material Design that gives you loads of customizable features to give your phone the closest, cleanest Material design that you can get. You get icons that mimic Material Design, the A-Z app list (in which you can hide the apps that you don’t want to see), and different ways to add quick shortcuts to your home screen and Google search bar. If Material Design is what you’re after--but you’re not enough of a fan of Google Now for the Google Now launcher--then Action Launcher 3 is perfect for you. A quietly great feature of this launcher is that you can import your settings from other launchers over, eliminating the need for hours of time wasted in set-up.There’s even a Pro version that gives you control of many more elements. 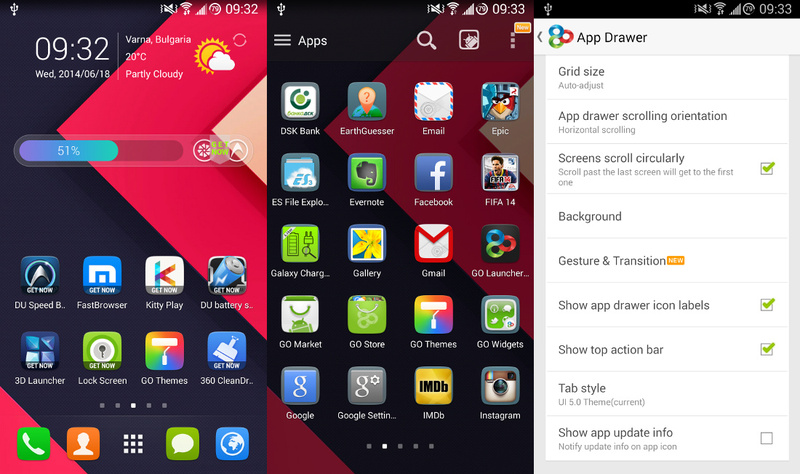 And that’s it for our list of top 5 launchers so far this year. Hopefully this at least gives you an idea of what you’d like to try in terms of customizing your phone. If your favourite one is not on here, let us know in the comments below!